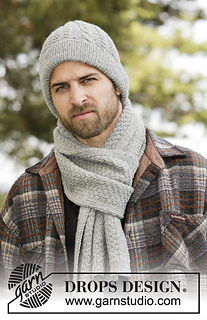 Set consists of men’s scarf and hat with cables, rib and texture in Karisma. DROPS double pointed needles and circular needle (40 cm / 16’’) size 4 mm/US 6 - or size needed to get 21 sts x 28 rows in stockinette st = 4’’ x 4’’ (10 x 10 cm). DROPS circular needle (40 cm / 16’’) size 3.5 mm/US 4 for rib.